Vendors at the Overland Park Farmers’ Market make a sale. Like other states, Kansas has seen a boom in the number and popularity of farmers’ markets in recent years. 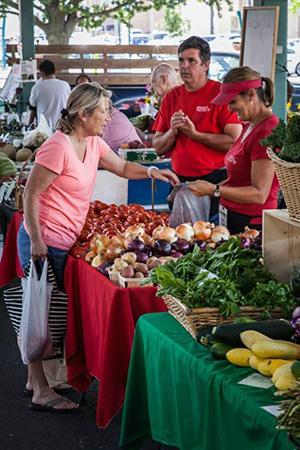 Image courtesy of Overland Park Farmers’ Market/ Jason Ebberts with TBL Photography. A group of farmers, horticultural experts and politicians from both sides of the aisle have come together to learn about local food in Kansas. The seven-member Local Food and Farm Task Force, established by Kansas Senate Bill 286, will prepare a report of their findings along with policy and funding recommendations for January 2016 session of the Kansas legislature. Monthly meetings started this past November and will continue through December 2015. The task force includes a horticultural expert from Kansas State University’s extension system, a Republican and a Democrat selected by their respective party’s legislative leadership, a member from the Kansas Department of Agriculture and three member appointed by the governor—including the chairman, Ron Brown, who is a family farmer and executive board member of the National Association of Conservation Districts. Kerry Wefald, Agriculture Marketing Director at the Kansas Department of Agriculture, attends task force meetings as a member of the administrative support team. According to Wefald, the current focus of the task force is to get an idea of what gaps exist in the state food system. Are there functional distribution networks for local foods in every region? What are successful farm-to-school, CSA or farmers’ markets doing right? Is crop insurance affordable for the specialty crops that small farmers often grow? What does it take for a small farmer to successfully partner with a big retailer? To answer these and other questions, the task force has been traveling around the state to meet a spectrum of experts, tour farms and food-processing facilities and absorb as much information as possible about the Kansas food system. In April, the group convened in central Kansas to see the distribution facility of Dillons, a large Kansas grocery chain, and get an understanding of the requirements small farmers have to meet to work with a grocery chain—crop insurance, food safety certifications and reliably delivering a high volume of produce, to name a few. Managers suggested that cooperative partnerships might enable small farmers to band together to sell at larger scales. Conventional agriculture has a substantial presence in Kansas and has interacted cautiously with the local food movement. Kansas Livestock Association (KLA), a group that represents ranchers and large feedlots, remained neutral on SB286, the bill that initiated the task force. Aaron Popelka, Vice President of Legal & Government Affairs at KLA, says that the association would keep an eye on the task force’s recommendations to make sure they do not disadvantage conventional agriculture. “There are a lot of hard-working Kansas farmers and ranchers that have decided to adopt a conventional view of agriculture to not just feed their neighbors but the entire world and we shouldn’t criticize them to promote local,” Popelka says. Though ‘big ag’ organizations hesitated to take a stance on the local food task force, Wefald has not seen any conflict arise as the task force has moved forward. “I wouldn’t say there’s a great divide between large producers and small producers,” says Wefald. “In our state we have all kinds of agriculture: very large agriculture, very small agriculture, niche markets. That’s the beauty of agriculture in Kansas, that we’ve got a little bit of everything.” At their meetings, the group has had presenters from both the Kansas Farm Bureau and the Kansas Rural Center, among many other groups. Though task force will not have formal recommendations ready until the end of the year, Wefald notes that due to budgetary limits, there are few specialty crop experts available through Kansas State University Cooperative Extension Service, a fact that limits small farmers’ access to information and advice. The task force has also seen a lack of access to fresh produce in rural areas of the state. To address this issue, some small towns have successfully organized a farmers’ market around a weekly produce delivery, allowing both residents and grocery store owners to shop when food is freshest and giving local growers a place to sell their goods.